This substantive collection from noted scholar Serene Jones explores recent work in the field of trauma studies. Central to its overall theme is an investigation of how individual and collective violence affect one's capacity to remember, to act, and to love; how violence can challenge theological understandings of grace; and even how the traumatic experience of Jesus' death is remembered. Jones focuses on the long-term effects of collective violence on abuse survivors, war veterans, and marginalized populations and the discrete ways in which grace and redemption may be exhibited in each context. At the heart of each essay are two deeply interrelated faith claims that are central to Jones's understanding of Christian theology: (1) We live in a world profoundly broken by violence, and (2) God loves this world and desires that suffering be met by words of hope, love, and grace. This timely and relevant cutting-edge book is the first trauma study to directly take into account theological issues. 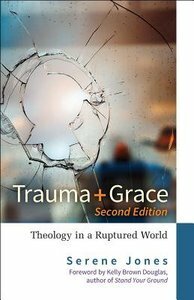 About "Trauma and Grace: Theology in a Ruptured World (2nd Edition)"
Kelly Brown Douglas, Ph.D. is The Elizabeth Conolly Todd Distguished Professor of Religion at Goucher College, Baltimore, Maryland. She is the author of "Sexuality and the Black Church: A Womanist Perspective".